The NBA is investigating the Los Angeles Lakers for alleged tampering involving Paul George after the Indiana Pacers filed a formal complaint. The league released a statement Sunday from Mike Bass, executive vice president of communications. "At the request of the Indiana Pacers, the NBA opened an investigation into alleged tampering by the Los Angeles Lakers," the NBA statement said. "The independent investigation is being conducted by the law firm Wachtell, Lipton, Rosen & Katz. The Lakers have been cooperative and, at this point, no findings have been made. We have asked both teams to refrain from commenting while the investigation is ongoing." Peter Vecsey on Patreon reported Saturday that Lakers president Magic Johnson, general manager Rob Pelinka and owner Jeanie Buss were contacted by an investigator for the NBA and asked to provide "any correspondence pertaining to" George, his agent and his parents. "As the NBA's statement made clear, we cannot comment about the specifics of any ongoing investigation," the Lakers said in a statement. "We can confirm, however, that we are cooperating fully with the NBA in the hope of clearing our name as soon as possible." The Pacers declined to comment when contacted by The Indianapolis Star on Sunday. George's agent contacted the Pacers on June 18 and informed the team that George would not return after his contract expired following the 2017-18 season and that his preference was to play for his hometown Lakers. 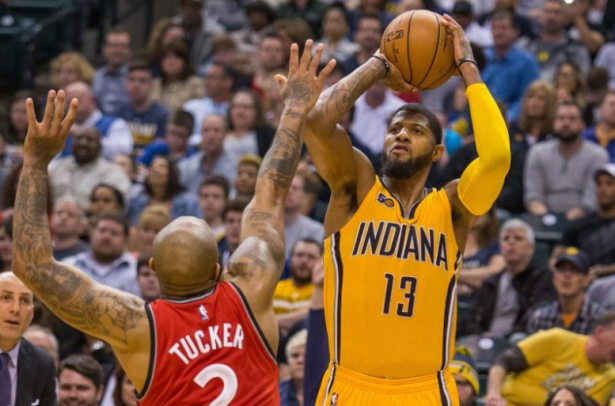 When contacted in June, a source told The Indianapolis Star the Pacers were more concerned about finding a trade for George. The Pacers dealt the All-Star forward to the Oklahoma City Thunder on June 30 in exchange for guard Victor Oladipo and forward Domantas Sabonis. George, who is from Palmdale, Calif., previously mentioned his admiration of Lakers legends Johnson and Kobe Bryant. Within an hour of an initial report about George's intentions to leave the Pacers, Johnson tweeted "God is good!" Johnson also acknowledged in a late-night TV interview in April that he would welcome George as a Laker.